True, this photo was taken at a Sydney shopping centre recently. Shopping centres are social places. We sometimes come to them not necessarily to go shopping, but rather to catch up with our family and friends. Shopping centres provide lounge suites and other areas to encourage such behaviours. On this, where is the best shopping centre to socialise at in Sydney? The Westfield Shopping Centres make great social meccas in opulence, however, for something outdoors and a little different/unconventional - I like World Square in the CBD. 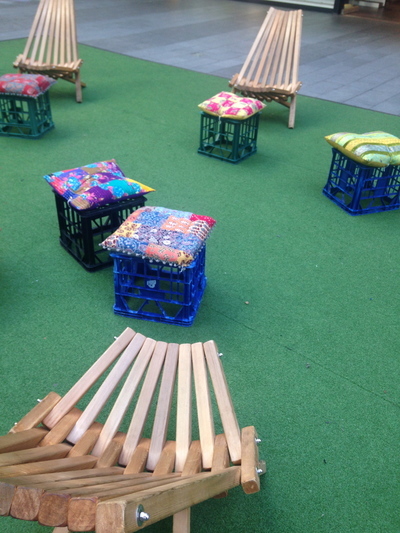 One day milk crates, and the next you're sitting on bean bags. Macquarie centre is great because it's close to public transport and also close to Macquarie university, making it a convenient place to visit after class if you study there. Other than Macquarie, I would have to say that I love Parramatta Westfield for its variety of stores, the convenience of transport to and from there and its whole general layout. I would have to say Chatswood Chase, purely because of the number of times I've run in to people I know there! I don't normally see Shopping Centres as a place to socialise. Sitting in a noisy food hall or on a bench outside shops is not exactly where I would like to be. Unless you are stuck in the suburbs most shopping centres are surrounding by much nicer places to sit and socialise. However if you want to combine fun shopping with coffee and food I would suggest that you head to the Harbourside Shopping Centre in Darling Harbour. There are lots of fun things to look at in the shop and some brands you can't easily find elsewhere as well as ones you are familiar with. After shopping there are numerous places where you can drink, dine or snack. Many of them have views and if you are feeling cheap you can just buy something to take out to sit by the water. If you are lucky there will also be entertainment as well.